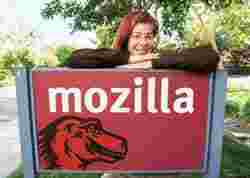 Mitchell Baker, chairperson of Mozilla Foundation and Mozilla Corp., is a lawyer-turned-tech evangelist who in the early 1990s helped set up the legal department at Netscape Communications Corp., later bought by AOL. Netscape is known best for the Web browser that lost the browser war with Microsoft Corp.’s Internet Explorer. What is the curious tale? The curious tale of Mozilla? Mozilla is the tale of something everyone knew could never happen. A few things happened in the early 1990s after Netscape’s great success. Microsoft appeared on the scene, Microsoft had its own browser. Eventually, through a series of activities that browser controlled something like 97%, meaning that 97 out of every 100 people who ever accessed the Internet always did it through one single means. And that, in turn, was a direct effect of having only one and no competition. But at the same time everyone knew it was impossible to compete with Microsoft in this space. And so it was left to Mozilla, the open-source small, scraggly child that no one really wanted except a few of us that were involved and no one thought it would ever succeed to take and fight this critical battle. Because it turns out that the browser is not irrelevant, it is the part that each one of us as a human being touches. It is the tool that we, as human beings, have to access the Internet and so it is not irrelevant, it is fundamental. And so, Firefox was launched in 2004. What is Mozilla’s manifesto and what are you trying to achieve through Mozilla? Mozilla is, at heart, an international public benefit organization. We are organized both legally and in our social covenants with each other to create public benefit and to build the Internet that is open and accessible and truly global and allows innovation across cultures and across a multitude of different business models and different companies. So the manifesto expresses that mission or that set of values. We are technically and legally a non-profit organization. That means that all of the value that we create is owned by the public and cannot be distributed among or to private persons as you would with shareholders. And so that’s the legal mechanism that re-enforces the Internet as public infrastructure. Tell us about your relationship with Google. You have a revenue-sharing relationship with Google. What about Google’s Chrome (Web browser) and what impact will it have on the relationship because there is a sense among certain people in the community that the folks that’ll switch to Chrome will come from the Firefox group. That’s a set of related questions. The first one is what impact does the revenue relationship have on the product or what impact does Chrome have on the revenue relationship. You know, I’ve said for many years that we keep the revenue relationship with Google separate from our product. So as to Firefox, the revenue relationship is irrelevant to what the product is or becomes. We’ll develop Firefox as best we can; as we think best. Firefox has a large share of the early adopters among its users and so I think we all expect that many of those early adopters will go look at Chrome. We expect most of them will come back. And there’s a bunch of reasons for those but clearly some will stay. We expect Chrome to have some market share; we don’t actually expect it to, like be a giant or take-off or any of those things but it will certainly have some market share. And it is quite possible that the early—the first few shares, the first few points of market share—come from Firefox. I’m not sure that’s anybody’s particular goal and we intend to win back...those users. You know, we expect that some of these people may stay with Chrome for—I don’t know; release, two releases, whatever—and come back. So, we’re not actually particularly worried about losing many of our users. There is that perception again that Google is trying to do the same thing that Microsoft did 10 years ago when you talked about the monoculture. How is Google different? First of all, Google’s different because Microsoft created a setting in which they had 99% market share on the OS (operating system) and 97% across the border—operating system, browser and desktop productivity apps. We have not seen Google remotely approach that setting now. And I know that the Google relationship with Yahoo! and Microsoft feels unbalanced. Like Google is clearly winning and that’s true! But imagine what it would be like if Google were 97% market share holder. Let’s switch to the success of Firefox. What went right for Firefox and what made the difference and what continues to make a difference in the success of Firefox? For Firefox, a couple of things lined up at the right time. First of all, it’s an important product. We talked about it earlier, how important it is. Not only was it important but the options were all bad. So people had a reason to look at something different. Three, we had the right product. So how do you get the right product? Sometimes it is the right people, sometimes it is luck, sometimes it is process. We rely somewhat on the right people and a lot on the right process—those two together which we had in Firefox and certainly we still do because if you look at Firefox 3, it really is a great browser—maybe the best that we’ve ever seen. Interestingly most of the Firefox users are not in the US but outside. For instance, in India, there are millions of Firefox users. How are you reaching out to them? What are you doing in terms of localization of Firefox? Well, we’ve always had an active localization community. In fact, I think Firefox is probably the leader in bringing real-time, multiple-language releases into consumer software. We have an odd way of doing this. We rely on local groups of people, volunteers to create the special aspects that are necessary. So, we localize both in language, menu items and so on but also for locale meaning we make sure the engine goes to the right place and various other parts of the products should be tuned and not just to a language but to the way you are. We have such communities in India and we’ve been spending more time with those communities and learning more about India, and trying to figure out what other locales are there, what’s the most important thing, the various different languages in India, is its localization not related to language so much but other aspects of being in India. What other way can we make it so that people can participate. So the reason that the localizers are good example of what’s important in Firefox is we’re trying to build communities of people who demand the ability to build the Internet we want. It is great to be a consumer and it is great when things appear for free; browsers appear for free and websites appear for free. And being able to consume that is such a wonderful thing. When it is free that is wonderful. But it only goes so far. But if all we are are consumers then, if something doesn’t work for us, we’re just stuck. What goals do you think you still have to accomplish both for yourself and for Mozilla? For Mozilla, the articulation about the importance of participation that we talked about today; this is new. We have been successful in explaining why this arcane piece of software like the browser matters and then demonstrating it and getting it into the hands of people. So first grade battle, we have done pretty well at. The next ones are, it is not just a browser—if I can’t get involved, if I’m willing to make that effort and the energy but I still can’t get involved and I can’t fix the things about my life that don’t work but I can’t get involved with the browser, I can’t get involved with the Internet, I can’t see it, I can’t understand it. If all I can do is consume it, better or worse— that is a failure of the Internet. That is a great challenge for Mozilla to explain that and to continue to demonstrate and put tools in the hands of people. It is just like the Internet were all out of the US and there was no way that content would ever break free of being US-centric and the only video you ever saw came out of US movie studios you know, produced in one culture—that would be a failure! And in the same way, the inability to access it to make it real—for me it would be a failure. And I think that is a pretty good-sized challenge and that encompasses data as well as other technologies. Excerpts from a radio interview by Kamla Bhatt.